Plasmodium falciparum ring-forms and gametocytes in human blood. Malaria is an infectious disease that is widespread in tropical and subtropical regions. It infects between 300 and 500 million people every year and causes between one and three million deaths annually, mostly among young children in Sub-Saharan Africa. Malaria is one of the most common infectious diseases and an enormous public-health problem. The disease is caused by protozoan parasites of the genus Plasmodium. The most serious forms of the disease are caused by Plasmodium falciparum and Plasmodium vivax, but other related species ( Plasmodium ovale and Plasmodium malariae) can also infect humans. This group of human-pathogenic Plasmodium species are usually referred to as malaria parasites. Malaria parasites are transmitted by female Anopheles mosquitoes. The parasites multiply within red blood cells, causing symptoms that include fever, anaemia, chills, flu-like illness, and in severe cases, coma and death. 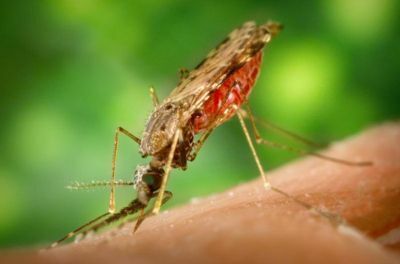 Malaria transmission can be reduced by preventing mosquito bites with mosquito nets and insect repellents, or by mosquito control by spraying insecticides inside houses and draining standing water where mosquitoes lay their eggs. Unfortunately, no vaccine is currently available for malaria. Instead preventative drugs must be taken continuously to reduce the risk of infection. These prophylactic drug treatments are simply too expensive for most people living in endemic areas. Malaria infections are treated through the use of antimalarial drugs, such as chloroquine or pyrimethamine, although drug resistance is increasingly common. Malaria has probably infected humans for over 50,000 years, and may have been a human pathogen for the entire history of our species. Indeed, close relatives of the human malaria parasites remain common in chimpanzees, our closest relatives. References to the unique periodic fevers of malaria are found throughout recorded history, beginning in 2700 BC in China during the Xia Dynasty. The term malaria originates from Medieval Italian: mala aria — " bad air"; and the disease was formerly called ague or marsh fever due to its association with swamps. 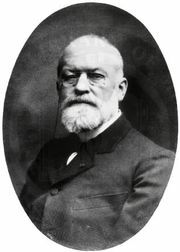 Scientific studies on malaria made their first significant advance in 1880, when a French army doctor working in Algeria named Charles Louis Alphonse Laveran observed parasites inside the red blood cells of people suffering from malaria. He therefore proposed that malaria was caused by this protozoan, the first time protozoa were identified as causing disease. For this and later discoveries, he was awarded the 1907 Nobel Prize for Physiology or Medicine. The protozoan was called Plasmodium by the Italian scientists Ettore Marchiafava and Angelo Celli. A year later, Carlos Finlay, a Cuban doctor treating patients with yellow fever in Havana, first suggested that mosquitoes were transmitting disease to humans. However, it was Britain's Sir Ronald Ross working in India who finally proved in 1898 that malaria is transmitted by mosquitoes. He did this by showing that certain mosquito species transmit malaria to birds and isolating malaria parasites from the salivary glands of mosquitoes that had fed on infected birds. For this work Ross received the 1902 Nobel Prize in Medicine. After resigning from the Indian Medical Service, Ross worked at the newly-established Liverpool School of Tropical Medicine and directed malaria-control efforts in Egypt, Panama, Greece and Mauritius. The findings of Finlay and Ross were later confirmed by a medical board headed by Walter Reed in 1900, and its recommendations implemented by William C. Gorgas in the health measures undertaken during construction of the Panama Canal. This public-health work saved the lives of thousands of workers and helped develop the methods used in future public-health campaigns against this disease. The first effective treatment for malaria was the bark of cinchona tree, which contains quinine. This tree grows on the slopes of the Andes, mainly in Peru. This natural product was used by the inhabitants of Peru to control malaria, and the Jesuits introduced this practice to Europe during the 1640s where it was rapidly accepted. However, it was not until 1820 that the active ingredient quinine was extracted from the bark, isolated and named by the French chemists Pierre Joseph Pelletier and Joseph Caventou. In the early twentieth century, before antibiotics, patients with syphilis were intentionally infected with malaria to create a fever. By accurately controlling the fever with quinine, the effects of both syphilis and malaria could be minimised. Although some patients died from malaria, this was preferable than the almost-certain death from syphilis. 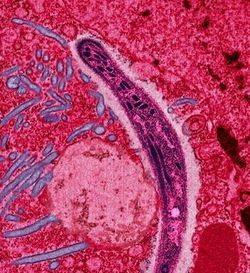 Although the blood stage and mosquito stages of the malaria life cycle were established in the 19th and early 20th centuries, it was not until the 1980s that the latent liver form of the parasite was observed. The discovery of this latent form of the parasite finally explained why people could appear to be cured of malaria but still relapse years after the parasite had disappeared from their bloodstreams. 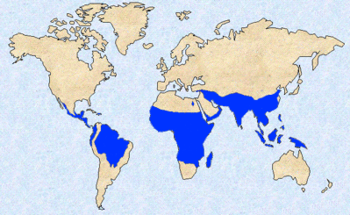 Areas of the world where malaria is endemic (coloured blue). Malaria causes about 350–500 million infections in humans and approximately one to three million deaths annually — this represents at least one death every 30 seconds. The vast majority of cases occur in children under the age of 5 years; pregnant women are also especially vulnerable. Despite efforts to reduce transmission and increase treatment, there has been little change in which areas are at risk of this disease since 1992. Indeed, if the prevalence of malaria stays on its present upwards course, the death rate could double in the next twenty years. Precise statistics are unknown because many cases occur in rural areas where people do not have access to hospitals or the means to afford health care. Consequently, the majority of cases are undocumented. Although co-infection with HIV and malaria does cause increased mortality, this is less of a problem than with HIV/tuberculosis co-infection, due to the two diseases usually attacking different age-ranges, with malaria being most common in the young and tuberculosis most common in the old. However, in areas of unstable malaria transmission, HIV does contribute to the incidence of severe malaria in adults during malaria outbreaks. Malaria is presently endemic in a broad band around the equator, in northern South America, South and Southeast Asia, and much of Africa; however, it is in sub-Saharan Africa where 85–90% of malaria fatalities occur. The geographic distribution of malaria within large regions is complex, and malarial and malaria-free areas are often found close to each other. In drier areas, outbreaks of malaria can be predicted with reasonable accuracy by mapping rainfall. Malaria is more common in rural areas than in cities; this is in contrast to dengue fever where urban areas present the greater risk. For example, the cities of the Philippines, Thailand and Sri Lanka are essentially malaria-free, but the disease is present in many rural regions. By contrast, in West Africa, Ghana and Nigeria have malaria throughout the entire country, though the risk is lower in the larger cities. Symptoms of malaria include fever, shivering, arthralgia (joint pain), vomiting, anaemia caused by hemolysis, hemoglobinuria, and convulsions. There may be the feeling of tingling in the skin, particularly with malaria caused by P. falciparum. The classical symptom of malaria is cyclical fevers, occurring every two days in P. falciparum, P. vivax and P. ovale infections, while every three for P. malariae. Severe malaria is almost exclusively caused by P. falciparum infection and usually arises 6-14 days after infection. Consequences of severe malaria include coma and death if untreated—young children and pregnant women are especially vulnerable. Splenomegaly (enlarged spleen), severe headache, cerebral ischemia, hepatomegaly (enlarged liver), and hemoglobinuria with renal failure may occur. Renal failure may cause blackwater fever, where hemoglobin from lysed red blood cells leaks into the urine. Severe malaria can progress extremely rapidly and cause death within hours or days. In the most severe cases of the disease fatality rates can exceed 20%, even with intensive care and treatment. In endemic areas, treatment is often less satisfactory and the overall fatality rate for all cases of malaria can be as high as one in ten. Over the longer term, developmental impairments have been documented in children who have suffered episodes of severe malaria. Chronic malaria is seen in both P. vivax and P. ovale, but not in P. falciparum. Here, the disease can relapse months or years after exposure, due to the presence of latent parasites in the liver. Describing a case of malaria as cured by observing the disappearance of parasites from the bloodstream can therefore be deceptive. The longest incubation period reported for a P. vivax infection is 30 years. Approximately one in five of P. vivax malaria cases in temperate areas involve overwintering by hypnozoites (i.e., relapses begin the year after the mosquito bite). A Plasmodium sporozoite traverses the cytoplasm of a mosquito midgut epithelial cell in this false-colour electron micrograph. Malaria is caused by protozoan parasites of the genus Plasmodium (phylum Apicomplexa). In humans malaria is caused by P. falciparum, P. malariae, P. ovale, and P. vivax. However, P. falciparum is the most important cause of disease and responsible for about 80% of infections and 90% of deaths. Parasitic Plasmodium species also infect birds, reptiles, monkeys, chimpanzees and rodents. There has been documented human infections with several simian species of malaria, namely P. knowlesi, P. inui, P. cynomolgi and P. simiovale; however these are mostly of limited public health importance. Although avian malaria can kill chickens and turkeys, this disease does not cause serious economic losses to poultry farmers. The parasite's primary (definitive) hosts and transmission vectors are female mosquitoes of the Anopheles genus. Young mosquitoes first ingest the malaria parasite by feeding on an infected human carrier and the infected Anopheles mosquitoes carry Plasmodium sporozoites in their salivary glands. A mosquito becomes infected when it takes a blood meal from an infected human. Once ingested, the parasite gametocytes taken up in the blood will further differentiate into male or female gametes and then fuse in the mosquito gut. This produces an ookinete that penetrates the gut lining and produces a oocyst in the gut wall. When the oocyst ruptures, it releases sporozoites that migrate through the mosquito's body to the salivary glands, where they are then ready to infect a new human host. The sporozoites are injected into the skin, alongside saliva, when the mosquito takes a subsequent blood meal. Only female mosquitoes feed on blood, thus males do not transmit the disease. The females of the Anopheles genus of mosquito prefer to feed at night. They usually start searching for a meal at dusk, and will continue throughout the night until taking a meal. 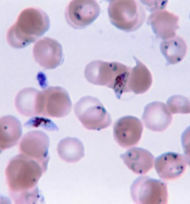 Malaria parasites can also be transmitted by blood transfusions, although this is rare. The life cycle of malaria parasites in the human body. The various stages in this process are discussed in the text. 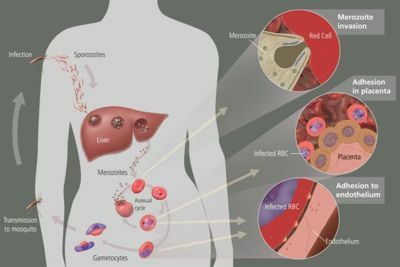 Malaria in humans develops via two phases: an exoerythrocytic (hepatic) and an erythrocytic phase. When an infected mosquito pierces a person's skin to take a blood meal, sporozoites in the mosquito's saliva enter the bloodstream and migrate to the liver. Within 30 minutes of being introduced into the human host, they infect hepatocytes, multiplying asexually and asymptomatically for a period of 6–15 days. During this so-called dormant time in the liver the sporozoites are often referred to as hypnozoites. In the liver they differentiate to yield thousands of merozoites which, following rupture of their host cells, escape into the blood and infect red blood cells, thus beginning the erythrocytic stage of its life cycle. The parasite escapes from the liver undetected by wrapping itself in the cell membrane of the infected host liver cell. Within the red blood cells the parasites multiply further, again asexually, periodically breaking out of their hosts to invade fresh red blood cells. Several of such amplification cycles occur. Thus, classical descriptions of waves of fever arise from simultaneous waves of merozoites escaping and infecting red blood cells. Some P. vivax and P. ovale sporozoites do not immediately develop into exoerythrocytic-phase merozoites, but instead produce hypnozoites that remain dormant for periods ranging from several months (6–12 months is typical) to as long as three years. After a period of dormancy, they reactivate and produce merozoites. Hypnozoites are responsible for long incubation and late relapses in these two species of malaria. Some merozoites turn into male and female gametocytes. If a mosquito pierces the skin of an infected person, it potentially picks up gametocytes within the blood. Fertilization and sexual recombination of the parasite occurs in the mosquito's gut, thereby defining the mosquito as the definitive host of the disease. New sporozoites develop and travel to the mosquito's salivary gland, completing the cycle. Pregnant women are especially attractive to the mosquitoes, and malaria in pregnant women is an important cause of stillbirths, infant mortality and low birth weight. Blood smear from a P. falciparum culture (K1 strain). Several red blood cells have ring stages inside them. Close to the centre there is a schizont and on the left a trophozoite. The preferred and most reliable diagnosis of malaria is microscopic examination of blood films because each of the four major parasite species has distinguishing characteristics. Two sorts of blood film are traditionally used. Thin films are similar to usual blood films and allow species identification because the parasite's appearance is best preserved in this preparation. Thick films allow the microscopist to screen a larger volume of blood and are about eleven times more sensitive than the thin film, so picking up low levels of infection is easier on the thick film, but the appearance of the parasite is much more distorted and therefore distinguishing between the different species can be much more difficult. From the thick film, an experienced microscopist can detect parasite levels (or parasitemia) down to as low as 0.0000001% of red blood cells. Microscopic diagnosis can be difficult because the early trophozoites ("ring form") of all four species look identical and it is never possible to diagnose species on the basis of a single ring form; species identification is always based on several trophozoites. Please refer to the chapters on each parasite for their microscopic appearances: P. falciparum, P. vivax, P. ovale, P. malariae. In areas where microscopy is not available, there are antigen detection tests that require only a drop of blood. OptiMAL-IT® will reliably detect falciparum down to 0.01% parasitemia and non-falciparum down to 0.1%. Paracheck-Pf® will detect parasitemias down to 0.002% but will not distinguish between falciparum and non-falciparum malaria. Parasite nucleic acids are detected using polymerase chain reaction. This technique is more accurate than microscopy. However, it is expensive, and requires a specialized laboratory. Moreover, levels of parasitemia are not necessarily correlative with the progression of disease, particularly when the parasite is able to adhere to blood vessel walls. Therefore more sensitive, low-tech diagnosis tools need to be developed for in order to detect low levels of parasitaemia in the field. Molecular methods are available in some clinical laboratories and rapid real-time assays (for example, QT-NASBA based on the polymerase chain reaction) are being developed with the hope of being able to deploy them in endemic areas. An active malaria infection (especially Falciparum malaria) is a medical emergency requiring hospitalization. When properly treated, someone with malaria can be completely cured. There are several families of drugs used to treat malaria. As it was cheap and effective, chloroquine was the antimalarial drug of choice for many years in most parts of the world. However, resistance of Plasmodium falciparum to chloroquine has spread recently from Asia to Africa, making the drug ineffective against the most dangerous Plasmodium strain in many affected regions of the world. There are several other substances which are used for treatment and, partially, for prevention (prophylaxis). Many drugs can be used for both purposes; larger doses are used to treat cases of malaria. Their deployment depends mainly on the frequency of resistant parasites in the area where the drug is used. The development of drugs was facilitated when Plasmodium falciparum was successfully cultured. This allowed in vitro testing of new drug candidates. Extracts of the plant Artemisia annua, containing the compound artemisinin or semi-synthetic derivatives (a substance unrelated to quinine), offer over 90% efficacy rates, but their supply is not meeting demand. Since 2001 the World Health Organization has recommended using artemisinin-based combination therapy (ACT) as first-line treatment for uncomplicated malaria in areas experiencing resistance to older medications. The most recent WHO treatment guidelines for malaria recommend four different ACTs. While numerous countries, including most African nations, have adopted the change in their official malaria treatment policies, cost remains a major barrier to ACT implementation. Because ACTs cost up to twenty times as much as older medications, they remain unaffordable in many malaria-endemic countries. The molecular target of artemisinin is controversial, although recent studies suggest that SERCA, a calcium pump in the endoplasmic reticulum may be associated with artemisinin resistance. Malaria parasites can develop resistance to artemisinin and resistance can be produced by mutation of SERCA. However, other studies suggest the mitochondria is the major target for artemisinin and its analogs. In February 2002, the journal Science and other press outlets announced progress on a new treatment for infected individuals. A team of French and South African researchers had identified a new drug they were calling "G25." It cured malaria in test primates by blocking the ability of the parasite to copy itself within the red blood cells of its victims. In 2005 the same team of researchers published their research on achieving an oral form, which they refer to as "TE3" or "te3." As of early 2006, there is no information in the mainstream press as to when this family of drugs will become commercially available. Although effective anti-malarial drugs are on the market, the disease remains a threat to people living in endemic areas who have no proper and prompt access to effective drugs. Access to pharmacies and health facilities, as well as drug costs, are major obstacles. Médecins Sans Frontières estimates that the cost to treat a malaria-infected person in an endemic country is between US$0.25 and $2.40. Sophisticated counterfeits have been found in Thailand, Vietnam, Cambodia and China, and are an important cause of avoidable death in these countries. There is no reliable way for doctors or lay people to detect counterfeit drugs without help from a laboratory. Anopheles albimanus mosquito feeding on a human arm. This mosquito is a vector of malaria and mosquito control is a very effective way of reducing the incidence of malaria. Methods used to prevent the spread of disease, or to protect individuals in areas where malaria is endemic, include prophylactic drugs, mosquito eradication, and the prevention of mosquito bites. There is currently no vaccine that will prevent malaria, but this is an active field of research. Many researchers argue that prevention of malaria may be more cost-effective than treatment of the disease in the long run, but the capital costs required are out of reach of many of the world's poorest people. Economic adviser Jeffrey Sachs estimates that malaria can be controlled for US$3 billion in aid per year. It has been argued that, in order to meet the Millennium Development Goals, money should be redirected from HIV/AIDS treatment to malaria prevention, which for the same amount of money would provide greater benefit to African economies. Efforts to eradicate malaria by eliminating mosquitoes have been successful in some areas. Malaria was once common in the United States and southern Europe, but the draining of wetland breeding grounds and better sanitation, in conjunction with the monitoring and treatment of infected humans, eliminated it from affluent regions. In 2002, there were 1,059 cases of malaria reported in the US, including eight deaths. In five of those cases, the disease was contracted in the United States. Malaria was eliminated from the northern parts of the USA in the early twentieth century, and the use of the pesticide DDT eliminated it from the South by 1951. In the 1950s and 1960s, there was a major public health effort to eradicate malaria worldwide by selectively targeting mosquitoes in areas where malaria was rampant. However, these efforts have so far failed to eradicate malaria in many parts of the developing world - the problem is most prevalent in Africa. Brazil, Eritrea, India, and Vietnam have, unlike many other developing nations, successfully reduced the malaria burden. Common success factors included conducive country conditions, a targeted technical approach using a package of effective tools, data-driven decision-making, active leadership at all levels of government, involvement of communities, decentralized implementation and control of finances, skilled technical and managerial capacity at national and sub-national levels, hands-on technical and programmatic support from partner agencies, and sufficient and flexible financing. Several drugs, most of which are also used for treatment of malaria, can be taken preventively. Generally, these drugs are taken daily or weekly, at a lower dose than would be used for treatment of a person who had actually contracted the disease. Use of prophylactic drugs is seldom practical for full-time residents of malaria-endemic areas, and their use is usually restricted to short-term visitors and travelers to malarial regions. This is due to the cost of purchasing the drugs, negative side effects from long-term use, and because some effective anti-malarial drugs are difficult to obtain outside of wealthy nations. Quinine was used starting in the seventeenth century as a prophylactic against malaria. The development of more effective alternatives such as quinacrine, chloroquine, and primaquine in the twentieth century reduced the reliance on quinine. Today, quinine is still used to treat chloroquine resistant Plasmodium falciparum, as well as severe and cerebral stages of malaria, but is not generally used for prophylaxis. Modern drugs used preventively include mefloquine (Lariam®), doxycycline (available generically), and atovaquone proguanil hydrochloride ( Malarone®). The choice of which drug to use depends on which drugs the parasites in the area are resistant to, as well as side-effects and other considerations. The prophylactic effect does not begin immediately upon starting taking the drugs, so people temporarily visiting malaria-endemic areas usually begin taking the drugs one to two weeks before arriving and must continue taking them for 4 weeks after leaving (with the exception of atovaquone proguanil that only needs be started 2 days prior and continued for 7 days afterwards). DDT was developed as the first of the modern insecticides early in World War II. While it was initially used to combat malaria, its use spread to agriculture where it was used to eliminate insect pests. In time, pest-control, rather than disease-control, came to dominate DDT use, particularly in the developed world. During the 1960s, awareness of the negative consequences of its indiscriminate use increased, and ultimately led to bans in many countries in the 1970s. By this time, its large-scale use had already led to the evolution of resistant mosquitos in many regions. However, given the continuing toll to malaria, particularly in developing countries, there is considerable controversy regarding the restrictions placed on the use of DDT. Some advocates claim that bans are responsible for tens of millions of deaths in tropical countries where previously DDT was effective in controlling malaria. Furthermore, most of the problems associated with DDT use stem specifically from its industrial-scale application in agriculture, rather than its use in public health. The World Health Organization (WHO) currently advises the use of DDT to combat malaria in endemic areas. For instance, DDT-spraying the interior walls of living spaces, where mosquitoes land, is an effective control. The WHO also recommends a series of alternative insecticides to both combat malaria in areas where mosquitos are DDT-resistant, and to slow the evolution of resistance. This public health use of small amounts of DDT is permitted under the Stockholm Convention on persistent organic pollutants (POPs), which prohibits the agricultural use of DDT for large-scale field spraying. However, because of its legacy, many developed countries discourage DDT use even in small quantities. Mosquito nets help keep mosquitoes away from people, and thus greatly reduce the infection and transmission of malaria. The nets are not a perfect barrier, so they are often treated with an insecticide designed to kill the mosquito before it has time to search for a way past the net. Insecticide-treated nets (ITN) are estimated to be twice as effective as untreated nets, and a offers greater than 70% protection compared with no net. Since the Anopheles mosquitoes feed at night, the preferred method is to hang a large "bed net" above the centre of a bed such that it drapes down and covers the bed completely. . The distribution of mosquito nets impregnated with insecticide (often permethrin) has been shown to be an extremely effective method of malaria prevention, and it is also one of the most cost-effective methods of prevention. These nets can often be obtained for around US$2.50 - $3.50 (2-3 euros) from the United Nations, the World Health Organization, and others. For maximum effectiveness, the nets should be re-impregnated with insecticide every six months. This process poses a significant logistical problem in rural areas. A new type of impregnated net, called Olyset, releases insecticide for approximately 5 years, and costs about US$5.50. ITN's have the advantage of protecting people sleeping under the net and simultaneously killing mosquitoes that contact the net. This has the effect of killing the most dangerous mosquitoes. Some protection is also provided to others, including people sleeping in the same room but not under the net. Unfortunately, the cost of treating malaria is high relative to income, and the illness results in lost wages. Consequently, the financial burden means that the cost of a mosquito net is often unaffordable to people in developing countries, especially for those most at risk. Only 1 out of 20 people in Africa own a bed net. A study among Afghan refugees in Pakistan found that treating top-sheets and chaddars (head coverings) with permethrin has similar effectiveness to using a treated net, but is much cheaper. A new approach, announced in Science on June 10, 2005, uses spores of the fungus Beauveria bassiana, sprayed on walls and bed nets, to kill mosquitoes. While some mosquitoes have developed resistance to chemicals, they have not been found to develop a resistance to fungal infections. Vaccines for malaria are under development, with no completely effective vaccine yet available (as of June 2006). A team backed by the PATH Malaria Vaccine Initiative, a grantee of the Gates Foundation, and the pharmaceutical company GlaxoSmithKline have announced results of a Phase IIb trial for RTS,S/ AS02A, a vaccine which reduces infection risk by approximately 30% and severity of infection by over 50%. The study looked at over 2000 Mozambican children. Further research will delay this vaccine from commercial release until around 2011. In January 2005, University of Edinburgh scientists announced the discovery of an antibody which protects against the disease. The scientists will lead a £17m European consortium of malaria researchers. It is hoped that the genome sequences of the most deadly agent of malaria, Plasmodium falciparum will provide targets for new drugs or vaccines. Sterile insect technique is emerging as a potential mosquito control method. Progress towards transgenic, or genetically modified, insects suggest that wild mosquito populations could be made malaria-resistant. Researchers at Imperial College London created the world's first transgenic malaria mosquito, with the first plasmodium-resistant species announced by a team at Case Western Reserve University in Ohio in 2002. Before DDT, malaria was successfully eradicated or controlled also in several tropical areas by removing or poisoning the breeding grounds of the mosquitoes or the aquatic habitats of the larva stages, for example by filling or applying oil to places with standing water. These methods have seen little application in Africa for more than half a century. Malaria is not just a disease common associated with poverty, but is also a cause of poverty and a major hindrance to economic development. The disease has been associated with major negative economic effects on regions where it is widespread. A comparison of average per capita GDP in 1995, adjusted to give parity of purchasing power, between malarious and non-malarious countries demonstrate a five-fold difference (US$1,526 versus US$8,268). Moreover, in countries where malaria is common, average per capita GDP has risen (between 1965 and 1990) only 0.4% per year, compared to 2.4% per year in other countries. In its entirety, the economic impact of malaria has been estimated to cost Africa US$12 billion every year. The economic impact includes costs of health care, working days lost due to sickness, days lost in education, decreased productivity due to brain damage from cerebral malaria, and loss of investment and tourism. In some countries with a heavy malaria burden, the disease may account for as much as 40% of public health expenditure, 30-50% of inpatient admissions, and up to 50% of outpatient visits. Malaria is thought to have been the greatest selective pressure on the human genome in recent history. This is due to the high levels of mortality and morbidity caused by malaria, especially the P. falciparum species. The best-studied influence of the malaria parasite upon the human genome is the blood disease, sickle-cell anaemia. In sickle-cell anaemia, there is a mutation in the HBB gene which codes for a haemoglobin subunit. The normal allele is HbA, but the sickle-cell allele, HbS, has a mutation from Glutamic Acid to Valine at amino acid 6. This change from a hydrophilic to a hydrophobic residue encourages binding between haemoglobin molecules, with polymerization of haemoglobin deforming red blood cells into a sickle shape. Individuals homozygous for HbS have full sickle-cell anaemia and rarely live beyond adolescence. However, this allele has sustained gene frequencies in populations where malaria is endemic of around 10%. This is because individuals heterozygous for the mutated allele (HbA/HbS), known as Sickle-cell trait, have a low level of anaemia but also have a greatly reduced chance of malaria infection. The existence of four haplotypes of HbS suggests that this mutation has emerged independently at least four times in malaria-endemic areas, further demonstrating its evolutionary advantage in such affected regions. There are also other mutations of the HBB gene which appear to confer similar resistance to malaria infection. These are HbE and HbC which are common in Southeast Asia and Western Africa respectively. 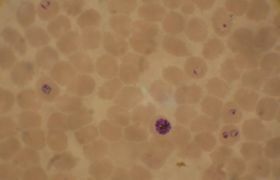 Another well documented set of mutations found in the human genome associated with malaria are those involved in causing blood disorders known as thalassaemias. Studies in Sardinia and Papua New Guinea have found that the gene frequency of β-thalassaemias is related to the level of endemicity in a given population. A study on more than 500 children in Liberia found that those with β-thalassaemia had a 50% decreased chance of getting clinical malaria. Similar studies have found links between gene frequency and malaria endemicity in the α+ form of α-thalassaemia. The Duffy antigens are antigens expressed on red blood cells and other cells in the body acting as a chemokine receptor. The expression of Duffy antigens on blood cells is encoded by Fy genes (Fya, Fyb, Fyc etc.). Plasmodium vivax malaria uses the Duffy antigen to enter blood cells. However, it is possible to express no Duffy antigen on red blood cells (Fy-/Fy-). This genotype confers complete resistance to P. vivax infection. The genotype has not been found in Chinese populations, has rarely been found in white populations, but is found in 68% of black people. This is thought to be due to very high exposure to P. vivax in Africa in the past. Glucose-6-phosphate dehydrogenase (G6PD) is an enzyme which normally protects from the effects of oxidative stress in red blood cells. However, a genetic deficiency in this enzyme results in increased protection against severe malaria.